Adding with hearts. Measuring with hearts. Graphing with hearts. 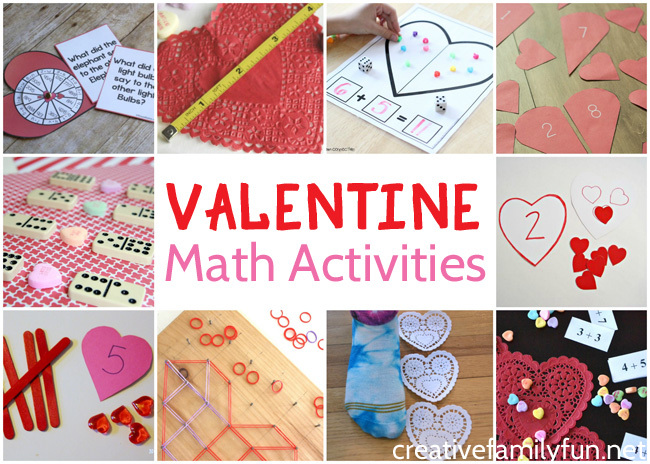 There are so many fun ways to incorporate Valentine’s Day into your math activities. 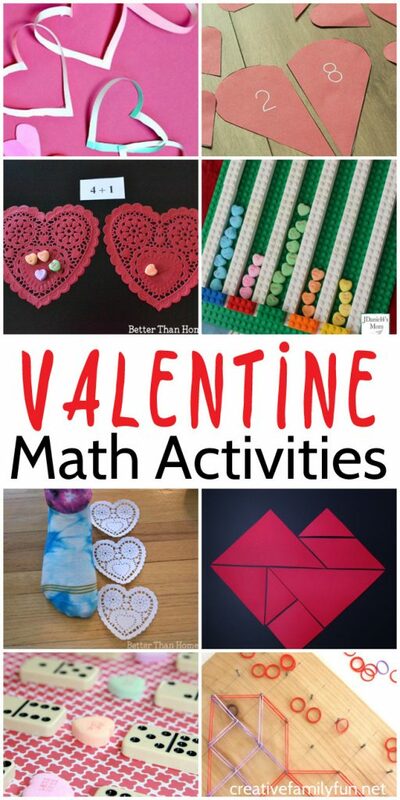 I’ve gathered up some fun Valentine math activities for kids in grades kindergarten through sixth grade. You’ll definitely find something fun to do with your kids. No matter what your child is working on, from counting to addition to division, there’s a way to add a Valentine’s Day twist. So, let’s get a little festive, indulge in all things hearts, and have some fun doing math. This simple heart counting game from Preschool Toolkit is perfect for kids that are currently working on counting. 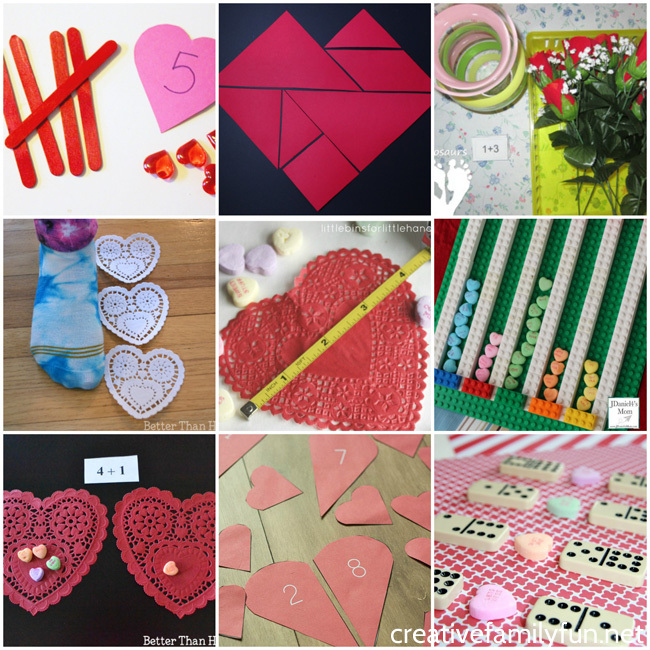 You can find another fun counting project at Play and Learn Everyday with this Valentine’s numbers and counting hearts activity. Work with a ten frame with this fun Portable Valentine’s Ten Frame from Lalymom. Count to 100 with this fun heart-themed Count to 100 Scavenger Hunt from Creekside Learning. Practice making geometric shapes for Valentine’s Day with this geoboard activity from Little Bins for Little Hands. Set up a Valentine’s Day math station to explore counting, addition, subtraction, tally marks, 3-D shapes and more. NurtureStore shows you how to set up a Valentine math station. Play around with tangrams with this printable heart tangram from JDaniel4’s Mom. Practice addition using beautiful red roses with this fun (and beautiful) math activity. You can find all the details at 3 Dinosaurs. Measure using non-standard units with our fun Measuring with Hearts activity. Little Bins for Little Hands also used non-standard units in this fun Candy Hearts Measuring activity. Practice graphing with this fun hands-on Valentine’s idea from JDaniel4’s Mom. Use candy hearts to practice addition with our fun Candy Heart Addition math activity. Heal broken hearts with this fun Broken Hearts Number Bonds activity at Rainy Day Mum. Practice addition with this printable heart-themed math mat from The Kindergarten Connection. Compare numbers and practice greater than and less than with this fun idea from Planning Playtime. Learn about Möbius strips and use them to create hearts for Valentine’s Day in this project from What Do We Do All Day. This is a great project for older kids combining art and math. Learn about the pattern of numbers called Pascal’s Triangle and create a Valentine’s Day project based off this concept with this activity from Teach Beside Me. Practice division with a fun secret code game. Go to Royal Baloo to print out this fun Valentine’s Day Division Code Breakers activity. 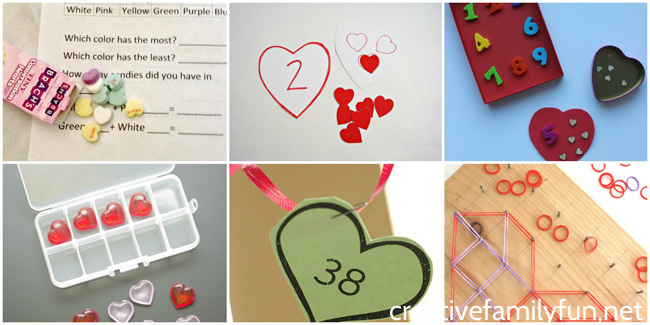 Get out your hearts and have some fun doing these Valentine math activities. We love using games to practice our math. It definitely makes learning fun. Here are some great ones you’ll love playing.